You are here: Home / Technical Insights / Rake and Trail: You Better Get It Right! A few weeks ago while riding on a remote Cleveland National Forest road, I came upon a guy standing next to a beat up and scratched KLR 650-E Kawasaki. During the conversation that ensued, the owner of the KLR told me that he had been crashing often on loose sandy surfaces. He decided to go online to discuss his problem. The so-called online expert advised installing a set of guards on the front of the bike and to replace the stock suspension links with “raising links” which of course his online expert would be happy to sell him. WRONG on both counts! If you want more stable handling on the soft loose surfaces, you don’t add additional weight to the front end and then raise the back end. What you have done is decrease the rake and trail thereby speeding up the steering that is also compromised by a heavier front end. You have compounded the problem. Remember the old motorcycle saying, “less trail, more flail” – well it’s true! The fact is that adjusting rake and trail is not that difficult but it can become dangerous if done improperly. Two good examples are 2 inch lowering links which can cause the rear tire to bottom out in the wheel well which is like applying the rear brake. The second example is pushing the front fork tubes up through the triple clamps too far which can cause the front tire to come in contact with the bottom side of the front fender and lower triple clamp, thereby causing a temporary lock up of the front wheel. Both of these situations can be bad for your health, but the front end lock up is obviously the worst of the two. All adjustments to rake and trail must be done carefully and only after meticulous measurements have been made of the chassis and suspension components involved including full open, full close, and the setting of proper ride height. 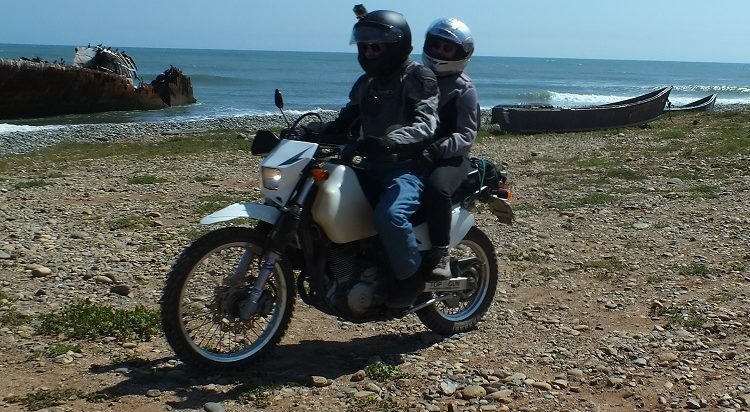 I have logged over 275,000 miles on DR’s and a little more than that on KLR 650 A’s since 1990. During the intervening 27 years I have employed numerous chassis and suspension settings, especially after my wife Pauline asked to ride tandem with me beginning in the early 1990’s. 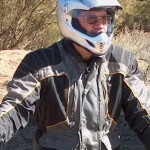 Two-up off-road riding presented a whole bunch of new motorcycle set-up problems, but luckily I began with a superb rider who could expertly balance the back of a heavyweight multi-surface motorcycle. Progressive Springs with normal preload, slight decrease in rebound dampening, and 10W special suspension fluid set 5mm higher than stock. (Note: all dampening settings worked out by suspension icon Stig Pettersson of PPS/Ohlins). Holding all the above stuff together were a pair of blue “lock-tighted” stock socket bolts at the bottom and a set of custom machined one inch-longer-than-stock fork caps on top. This allowed the fork tubes to be pushed downward, thereby creating more rake and trail. The final touches up front were Buchanan stainless spokes and wider 21 inch rim with a proper knobby tire, wider and larger in diameter than stock and equipped with heavy duty tube and rim lock. The first thing I did was engineer and have machined a set of links which lowered the A model approximately 1 inch. I then installed my PPS/Ohlins rear shock that Stig Pettersson custom built for me in 1992. (I’m sure it was the first remote reservoir Ohlins’ shock ever built for a KLR 650). It took a while to get the correct spring for a tandem rider load of 350 pounds but Jerry Wohlgemuth of Ohlins USA finally “nailed” it at 9.5 kg/mm. The rear wheel rim and tire diameter remained stock but we installed a high quality knobby tire complete with a heavy duty tube and rim lock. Oh, and as always we installed a set of those great Buchanan’s heavy duty stainless steel spokes. In closing I would say that most stock multi-surface motorcycles, even the heavy ones, are fine on pavement, but many steer too quickly off-road especially on soft surfaces. Slower steering (read more rake and trail) is always the safest answer. Just be sure you make the changes correctly.